Bought from Penther brothers at the beginnning of the 80s, this fantastic 5.5 has been owned for a while by Jean-Luc Boucher, son of a Naval officer and a great sailor, who christened her "Sagamore". He sailed her a lot off Benodet and Sainte Marine, close to Glenan Islands in southern Brittany. Damaged at Pichavant boatyard, after long and sad legal battles between insurers, she came finally into Pichavant's hands. Acheté aux frères Penther au début des années 1980, cet exceptionnel 5.50 a été la propriété de Jean-Luc Boucher, fils d'Officier de Marine et grand amoureux de la voile, qui l'a nommé Sagamore, et qui a beaucoup navigué avec au large de Sainte Marine, en plein pays bigouden, non loin des Glenan. Accidenté aux chantiers Pichavant, il fut l'objet de tristes bagarres d'assureurs et finit par être récupéré par Pichavant. At a time she was christened "Bagheera" and owned by PENTHER brothers. Then she became "Bijou Bihan" (when exactly is not known yet). In 1995 she was offered for sale at Moinard's yard at la Rochelle. 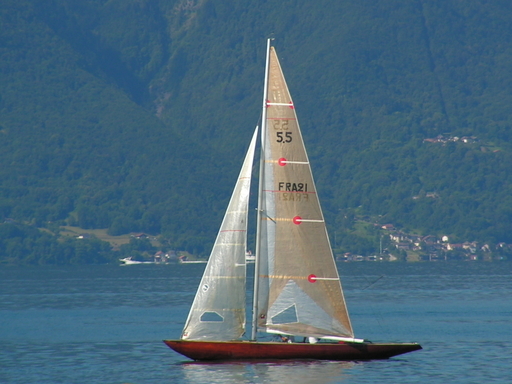 The first name of FRA 21 was Sagamore, and she got this name back in 1999 when Laurence FONTAINE became her new owner.